It takes “Only 10 minutes from full shampoo and wash to completely dry. I use different settings on the heater control panel with 10 - for drying, 6 - for clipping and 3 - for general maintenance work with my horses. I find this not only warms and dries them, but also has a very soothing cathartic effect.”, says the 2012 Olympic Winner Peter Charles. “The installation was really quick and simple and I have been really impressed with the friendly advice always on hand from the expert team at Chillchaser® and their distribution partner HeatOutdoors™”. Featured above with Peter is Nevada who is an 11 year old chestnut Selle Francaise Superleague show jumper that has represented the UK 6 times in international competition and “almost” went to the 2012 Olympics. Full remote control enables fine tuning of the heat intensity whilst working with the horses and without having to leave the stall. 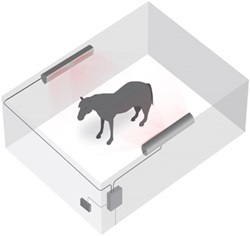 The health and therapeutic benefits of infrared heat have long been recognised in both the human and veterinarian worlds, however, until recent advances in heat lamp technology, users have had to put up with massively cumbersome equipment that was largely ineffective, expensive to buy and in many instances actually scared the horses they were intended to help. 2012 Olympic Gold Medal winner Peter Charles had exactly this problem. Some of his award-winning horses were so scared of walking under the oppressively looking infrared heating gantry where any potential benefits were massively outweighed by the physiological trauma to the unfortunate horses. 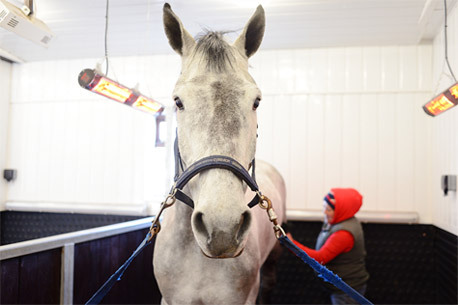 It was at this point just after winning his Olympic Gold that he contacted Chillchaser®'s distribution partner HeatOutdoors™ and installed their market leading Low Glare Equestrian Solution.